Clyde McBride is one of those everyday saints who, without much fanfare, go about the work of changing, and sometimes saving, the lives of children. 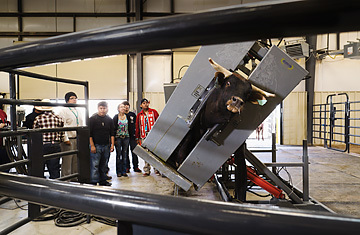 He teaches agricultural science on the Navajo reservation in Kayenta, Ariz. He's a memorable-looking fellow, with his cowboy hat, horsehide tie and a body like a giant sack of flour perched on tiny toothpick legs. His most notable characteristic, though, is his persistence. When a new school superintendent arrived in town a few years ago, McBride parked himself on the guy's doorstep. "He came in and gave me the 'I have a dream' speech," says superintendent Harry Martin. "I told him I'd think about it, but he wouldn't let me think about it. He was bugging me three, four times a week about it." McBride's dream was a state-of-the-art agricultural-sciences building with two veterinary operating theaters--one for small animals and one for large ones--to train Navajo kids to be veterinary aides and technicians and perhaps even to start a few of them down the road to becoming veterinarians. "I thought it was a waste of money and time," Martin told me. "I'm an old English teacher. I was very skeptical about vocational education. We needed to be drilling them on basic skills. But McBride said he'd make a believer out of me. And he did." Two years later, with the $2.4 million agricultural- and technical-sciences building up and running, Martin says, "It's without doubt the best program we have. It's an alternative way to teach them math, science and reading. They love it. They're attentive, working hard, hands on." McBride imports veterinarians from around the country to visit the reservation and work with the 226 students, who assist in both operating theaters, prepping animals for surgery and learning how to suture, draw blood and give injections. The veterinary clinic has become a valued resource on the reservation, but more than that, the academic results have been spectacular. "Nearly every one of these kids passed the state comprehensive test we give to 17-year-olds in Arizona," Martin told me. "Less than about 40% of my non-vocational-education students passed." Vocational education used to be where you sent the dumb kids or the supposed misfits who weren't suited for classroom learning. It began to fall out of fashion about 40 years ago, in part because it became a civil rights issue: voc-ed was seen as a form of segregation, a convenient dumping ground for minority kids in Northern cities. "That was a real problem," former New York City schools chancellor Joel Klein told me. "And the voc-ed programs were pretty awful. They weren't training the kids for specific jobs or for certified skills. It really was a waste of time and money."